This year, I was smart -I had all my posts prepared and scheduled to go- That was so nice for me. I could visit other blogs, and make comments. I enjoyed it but I am always happy to see the next month. It sure makes April go by fast. Toward the middle of April, I kept forgetting to add my link to the list. No biggie. It all worked out. I met some nice bloggers and learned a few things, I did not know. There is a lot of talent out there. One blog I was amused by was John David Frain - a crime fiction. 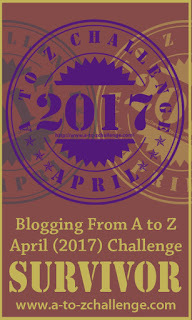 He took the April A-Z challenge and every day, Frain would die a horrible death - each day in a new way. Barbara at Life and Faith in Caneyhead - real life, real stories, real blog. Always a good read. Dorky Mom Doodles was awesome. A dorky doodle every day in April. and there were much more that I am too lazy to list right now. As there is every year, there were some who started out doing well and for whatever reason totally dropped out. Will I do it again next year? Maybe. I usually make my decision around Feb. If you've never done it before- try it. You have to try it at least once. You get to meet and follow new blogs and make new blogger friends, which is always a treat. That's really why I do it. Thanks and I forgot to add you with your Hot Men...pretty funny stuff/. I think we "met" through one of the A/Z challenges. It is fun to do. My heart wasn't in it this year due to family things going on. We'll see about next year. It is definitely a good way to meet fellow bloggers. We made it! By the last week I am always dragging, but happy. This is the third time I've heard Frain mentioned, suppose I really need to check that out. Thank you for the kind words! Oh yeah, Frain was pretty funny.